Are you having a camouflage themed wedding? This ring might be the perfect fit. It is 8MM wide, making it ideal for a Men’s Wedding Band, is made out of solid Tungsten Carbide, and has a great woodland camouflage inlay. The woodland camo is done in the style of the older generation Army uniforms, the generation of uniforms that was replaced by the ACU’s. So if you’re a little nostalgic for that era of uniform, and want to show off your support – or perhaps your veteran status, that makes this a great choice as well. You are purchasing one Woodland Camo Tungsten Ring. 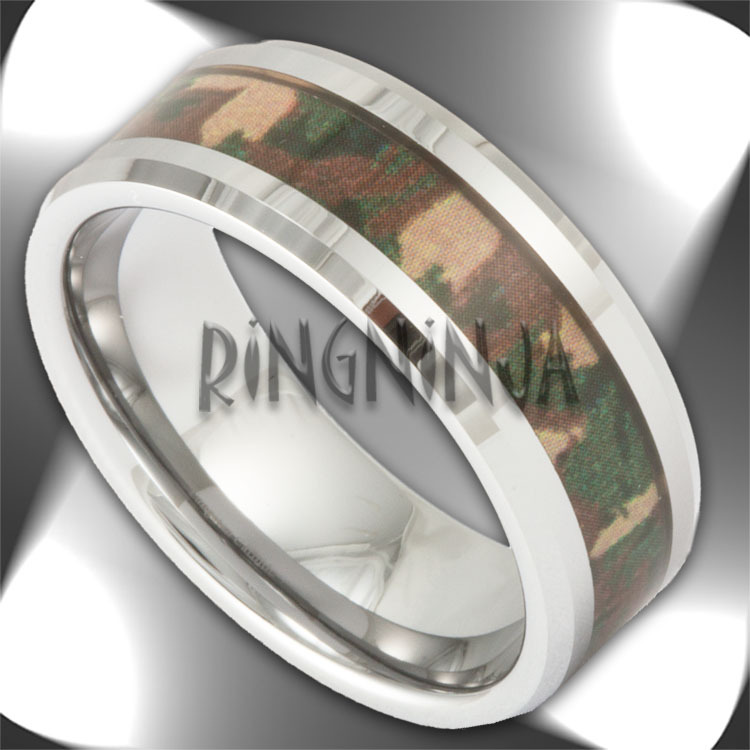 This ring is 8MM in width, has a beveled edge, and a very distinctive Woodland Camouflage inlay. Whether you are old school Army, or just a fan of the camo look – this is the ring for you! The metal is polished to a high shine. This is a scratch resistant ring – making it a rugged look, as well as a rugged ring! This 8MM Woodland Camouflage Tungsten Wedding Ring is a popular choice for a wedding band, but can certainly be worn as a great piece of jewelry.